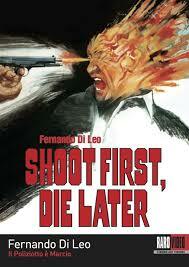 SHOOT FIRST, DIE LATER sounds more like a title for a Spaghetti Western than a modern day Eurocrime. I'm sure this film has many different titles and translations depending on what market of the world it was distributed to. Director Fernando Di Leo has made an excellent entry into the genre. The first thirty minutes or so I wasn't very impressed. The film is kind of ordinary in it's initial appearance. Most likely the film was quickly shot. There isn't any well thought out creative camera angles and compositions to make the film any different from all the other hastily made Dirty Harry knock offs from seventies Italy. I can't even remember the music. However, if you wait you will be rewarded with a simple but very compelling story about the consequences of police corruption. Its the story that makes SHOOT FIRST worth a watch. The ending is great too which I will be spoiling completely in this review because I love it! SHOOT FIRST, DIE LATER opens with a large bow tied mafia boss named Pascal having a bunch of local drug dealers shot in the legs for doing business behind his back. Later an eccentric old man tries to leave his house to get milk for his cat but his gate has been blocked by a couple of cars to where he can't get out. This prompts the old man to file a police report. Meanwhile police officer, Domenico (Luc Merenda) busts some gun runners. After being glorified for the bust Domenico gets word to show up to a meeting. That meeting ends up being with Pascal. Domenico is actually working for the mob! They inform Domenico that there was a report filed involving the parked cars that links Pascal to a recent murder. Domenico is to get rid of that report. The problem is that with the escalation of the murder investigation everyone involved with filing that report is now a witness and Domenico knows it. The police officer who wrote down and filed that report just happens to be Domenico's father. CLICK HERE TO READ THE REST!!! A TASTE OF KILLING needs a re-release!